Pope Benedict XVI ordained 24 new cardinals in a ceremony at Saint Peter’s Basilica, in Rome, yesterday. 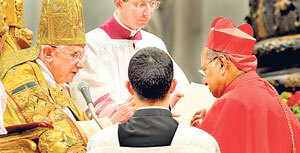 Sri Lanka’s Archbishop Malcolm Ranjith was among the new cardinals. Cardinal Malcolm Ranjith, who turned 63 last Monday (November 15), was ordained as a priest in 1975 at St. Peter’s Basilica in Rome by Pope Paul VI. He was appointed Auxiliary Bishop of the Archdiocese of Colombo in 1991; Bishop of Ratnapura also in 1991, and Archbishop of Colombo in June last year.